Concerned about the contemporary political atmosphere and want to know one way you can take action? 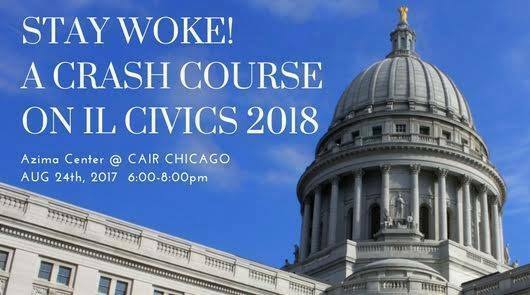 Join CAIR-Chicago for an interactive workshop with our Government Affairs Department for crash course on Illinois politics, key issues (e.g., financial aid, minimum wage, taxes, environmental justice, prison reform), and the upcoming Governor’s election in 2018. Learn about current issues being discussed at the state and local congressional level and how to be informed and effective voters for social change! This event is free and open to the public, but please be sure to RSVP here, to ensure capacity limitations are not exceeded.